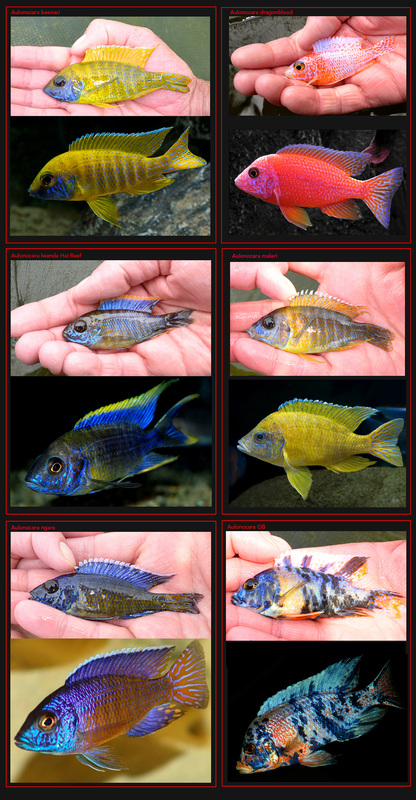 Below and on the following pages you will find images of our Cichlid brood stock, once as they appear when we sort them for breeding and for sale and below that what what the species looks like when adult and in full colour. 95% of the species we sell are F1 fish — meaning first generation offspring from wild-caught parental stock. This guarantees the natural qualities inherent in wild Cichlids. Nature plays a numbers game in the wild. As a result, thousands of fish eggs can be produced, and still deliver no more than just a few fully grown adults. The rest of the eggs or fry become a food source for the living and breeding population. It is estimated that in the wild, every adult pair of Cichlids will only produce +- two offspring that will develop into full adult breeding fish, irrespective of how many eggs result from the parents’ spawning. (or else the overall population would be exploding). Thus thousands upon thousands of offspring are ‘weeded out’ in terms of ‘survival of the fittest’. Then, those adults who have what it takes to survive, have to compete with each other for the opportunity to spawn. Wild Caught stock are therefore not highly regarded because of the ‘genetic diversity’ but instead are highly regarded because they are the direct result of millions of generations of the ‘survival of the fittest’ pattern, produced after millions of generations of ‘natural selection’. Thus, two unrelated, less than ideal tank bred specimen will offer ‘genetic diversity’ to a hobbyist who wishes to breed his or her fish, but they will not offer the ‘genetic superiority’ of wild bred, wild born, wild raised fish. In the same way wild caught juveniles have not ‘proven’ themselves through the process of ‘survival of the fittest’ the way wild caught adults have, which is why fish caught in the wild as adults are held in much higher regard than fish caught in the wild as juveniles. F1 therefore means that the first generation offspring, who are only one single generation away from the ‘proven’ wild-caught adult parents, is superior to specimen bred from captive, tank bred parents. By buying F1 species, you are in fact guaranteed quality, as well as the knowledge that the species you bought has not had its genes ‘watered down’ during the breeding process because of unsuitable matches, or species ‘weakening’ because of the repeated use of captive bred parents that themselves stem from several generations down the line. Our use of the scientific species names for this species is to ensure that we are all talking about the same thing when we discuss Cichlids. Note that some scientific names have also recently changed. We are using the correct new names, and will try to keep our scientific names updated as soon as we can.